As a pet writer and crazy dog lady, May is one of my favorite months: National Pet Month! It's a time to celebrate the benefits pets bring to our lives - and even to the lives of others. For instance, Steve Fontenot, a therapy dog handler in San Antonio, Texas, has witnessed the healing power of animals many times. His dog Bellin, a Husky who was rescued from a home where he endured severe physical abuse, now visits several times a week with patients in hospitals and children in crisis. In one moving instance at a children's shelter, Bellin sat down next to a quiet boy who was about 9 years old. The child started petting the dog and asked about him. He heard the "kid version" of Bellin's past abuse. "Then he said, 'Oh, he was beaten like me,'" Fontenot recalled. "It was one of the first times this kid had opened up about what he had gone through. To know we helped make him feel comfortable enough to begin to acknowledge and talk about it ... you walk out of a therapy visit feeling like you got therapy too." 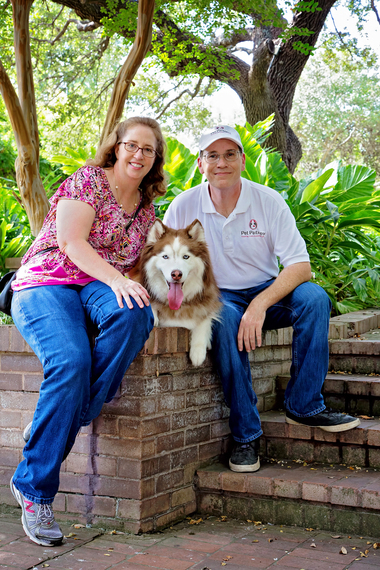 Therapy dog Bellin with handlers Kassia Kubena, MD, and Steve Fontenot. Photo by Sandy Walker Photography. 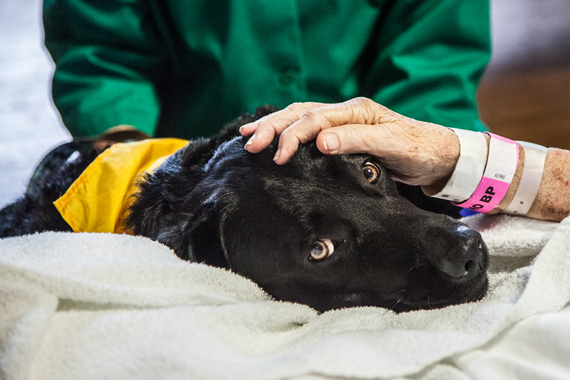 Bellin is one of approximately 14,000 therapy animals - including more than 9,000 dogs - registered with Pet Partners, a nonprofit based in Bellevue, Wash. with volunteers in all 50 states. Through the organization's various human-animal interaction programs, pets and their owners provide comfort and smiles to veterans with PTSD, seniors with Alzheimer's disease, hospital and hospice patients, people with intellectual disabilities and children with literacy challenges. "Our teams want to bring joy and spread love with their animals," said Traci Pryor, senior director of national strategic partnerships at Pet Partners. "They typically make over a million visits each year across the country." The Human Animal Bond Research Initiative (HABRI) Foundation in Washington, D.C. maintains a database of scientific research that demonstrates the health benefits of spending time with animals, such as lower blood pressure, reduced stress and depression, and increased odds of surviving a heart attack. But these findings are no surprise to volunteers with Pet Partners, who love to share their pets with people who could use an emotional boost. Pryor said therapy animal handlers report many remarkable encounters, such as hospital patients who have emerged from comas and asked, "Where's that dog that visited me?" And often dogs visiting people with Alzheimer's disease will help spark a memory of a childhood pet. "When remembering things is such a challenge and memories are so fleeting, petting someone else's animal brings that back and will bring a smile to their face," Pryor said. "There are beautiful ways lives are impacted in a positive way." Therapy dog Chili. Photo by Kim Leeson. Pet Partners volunteer Kim Wright visits hospitals with her Goldendoodles Clarke and Callie each week. She's been particularly moved to see her dogs bond with children with autism, and surprised by how much comfort they bring to visitors and stressed hospital staff. She loves seeing people "light up" when they meet her dogs. "Every time you go in (for a therapy dog visit) you know you're making somebody's day," she said. "There's always somebody there that needs your help." Therapy dog Bellin spreading smiles. Photo by Sandy Walker Photography. Wright said her dogs enjoy the challenge and stimulation of being therapy dogs (though they aren't fans of the bath required before visits). Pet Partners therapy animal teams must pass the certification test every two years to ensure the safety of everyone involved, and to make sure the animals still excel at - and like - the work. "They're all ready to be petted and touched and loved, and share that part of themselves," Wright said of animals in the program. 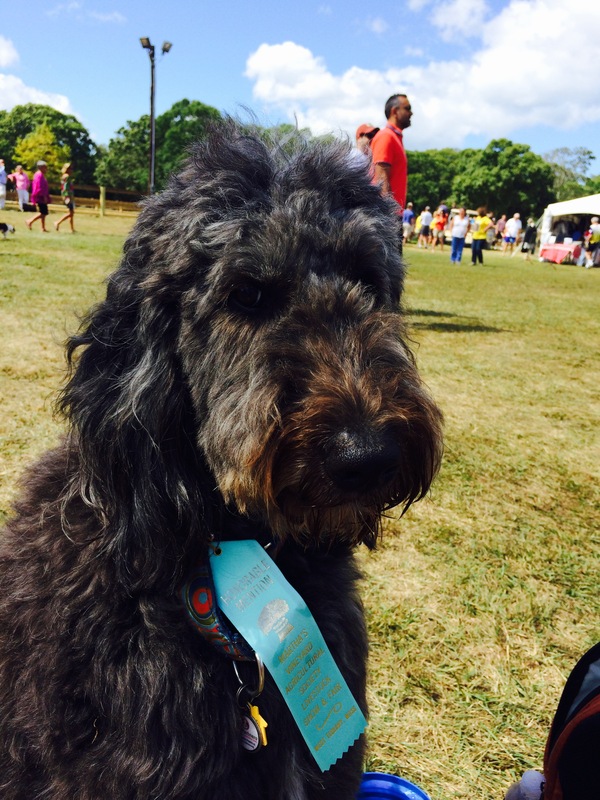 Kim Wright's therapy dog, Clarke. Pryor emphasized that though most people volunteer with their dogs, Pet Partners registers a variety of species, including cats, birds, rabbits, pigs, llamas and miniature horses. "People are able to volunteer with many different pets. It's just a wonderful way to impact lives and volunteer with your animal," she said. "That makes folks happy because they'll say, 'I want to take my pet everywhere!' There are a lot of ways to get involved ... It's an excellent way to help serve folks in your community." For more information, visit https://petpartners.org/ or http://treatsandsweetsday.donordrive.com/.